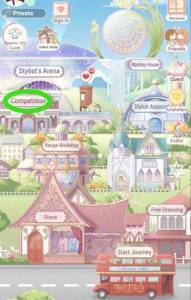 Another PVP-ish (well, you are competing with other players) mode of the game is the "Competition". Found just right below the Stylist’s Arena, you can take part in the competition as a contestant, or as a judge to critic other player's sense of fashion. Each competition is given a theme/motif and all the participant has to do is to dress accordingly and fashionably that people judging would give you higher scores. Otherwise, you can also participate as a "Judge" -- basically scoring other people's fashion creations. The running theme usually last 4 days, and are usually vague/broad themes which can pretty much give you a wide range of options to dress your Nikki with. At the end of each season, participants are awarded with crystal roses, gold coins, and diamonds -- based on how you ranked in the competition. In return, you'll be able to use these special currency at the "Crystal Garden" in exchange for some selection of outfits. Before the season expires, you are given the chance to improve your "submitted" entry, but be cautious as it would also reset your entries' current "total likes" value. Being the "trend-setter" takes a lot of playing the game (investing a lot of time in it) and getting known by the community of players from scratch. Don't expect to roll out and be known on your first few creations. You should also have solid number of friends or at the very least an association to back you up. Of course, none of these would matter if your fashion sense isn't up to par with the other competitors. Nonetheless, it is always free to enlist, so just make the most out of it, and create the best outfit you could pull-off (from your wardrobe) that fits the theme, and one that could plausibly interest other players. Remember that whenever you judge 10 times, you'll also get a hefty number of same rewards (crystal rose, gold coins, diamonds,and even stamina).